‘In addition to my personal motor sport participation, I had for some years been a contributor to the motorsport media and one of the monthly contributions I made actually took over from an old acquaintance, Mike Kable who had moved to a full-time position with the Murdoch Press. 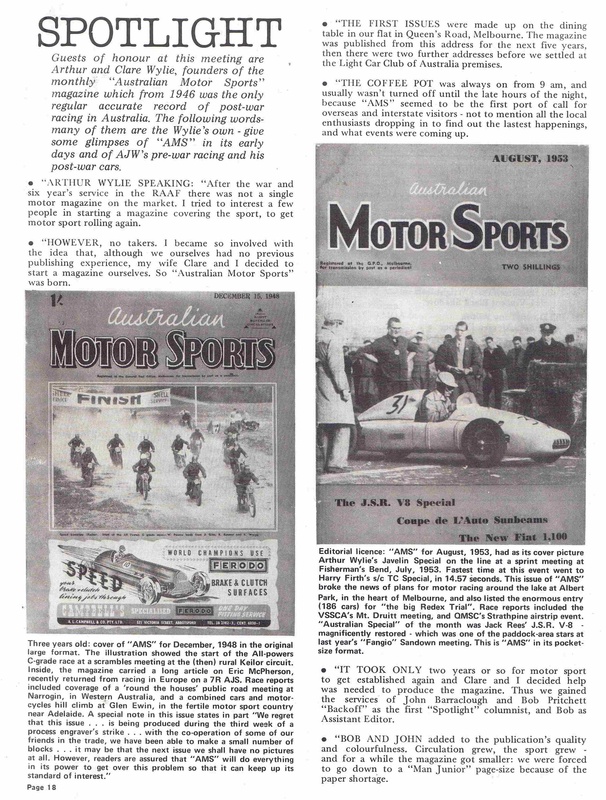 My new task was to assemble ‘Spotlight’ for the first magazine of its type in the country – ‘Australian Motor Sports’. Initially edited and published by Arthur Wylie, a well known driver and enthusiast, it is a collector’s item these days. I also took photographs such as this cover shot of Ray Kenny driving Barry Collerson’s Lago Talbot T26C at Castlereagh Airstrip. Spotlight was fun as I made it my business to collate about forty snippets of information for each monthly edition of the magazine. This meant my phone was often busy as I chased up the same number of informants. My association with both Jowetts and Arthur Wylie was the catalyst that created an interest by me to purchase a racing car built by Arthur some fourteen years prior with support from the importers of Jowett. It used a Jowett Javelin engine that was supercharged but it was far more innovative than that, as the construction placed the engine behind the driver. This was in the period when the only other post war race cars with a rear engine, used motor cycle engines. However, while the Wylie project was quite different to local thoughts, it was not in contravention to that permitted within Grand Prix car rules. 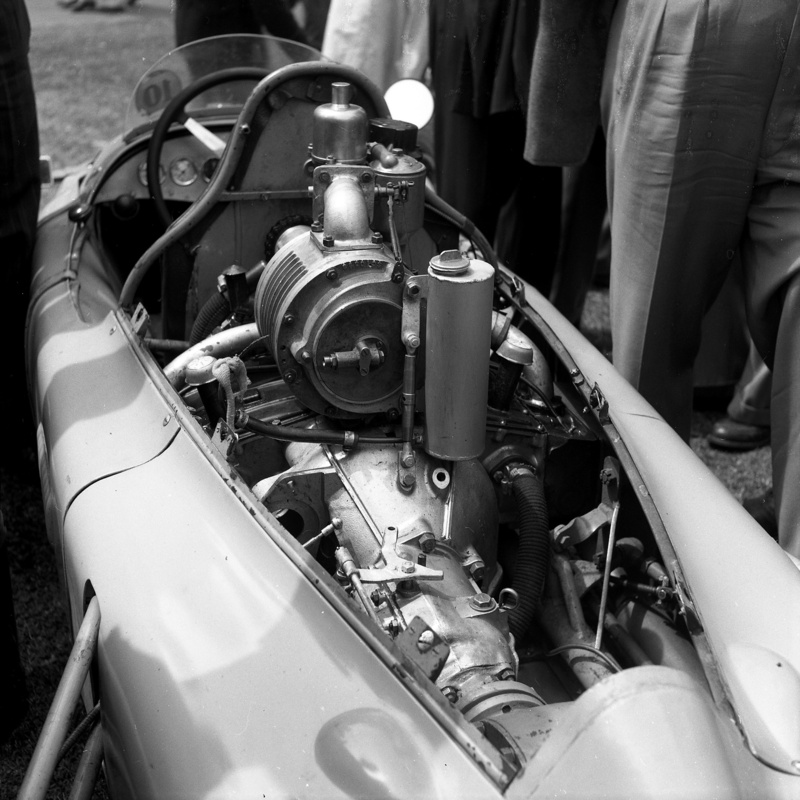 Furthermore, the rules at the time allowed engines up to 4500cc normally aspirated. 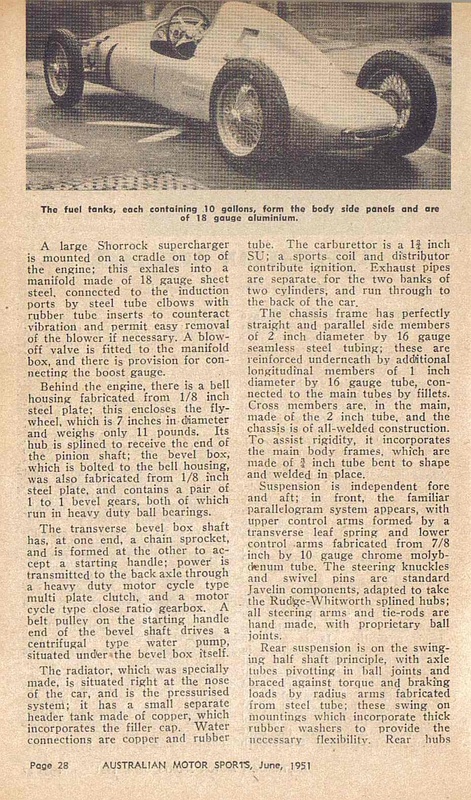 Or if supercharged, the engine capacity was limited to 1500cc – this latter was the concept that Wylie used. As it eventuated I purchased the supercharged Wylie Javelin in March 1963 and retained ownership until September 1997 and during that period it was actively used with many successes. 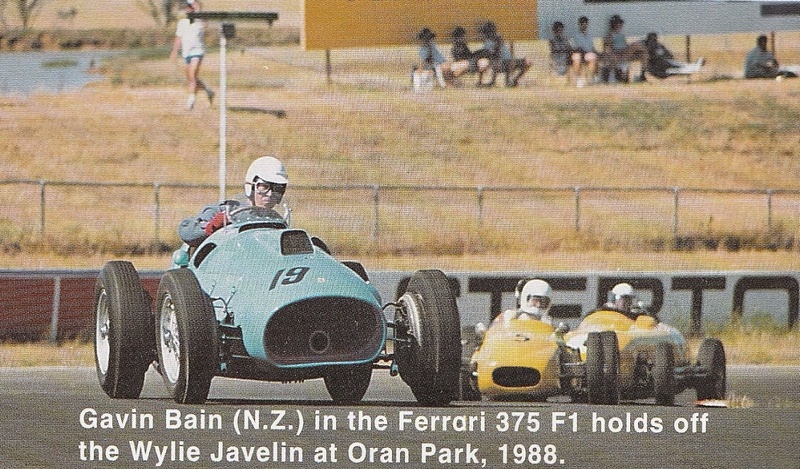 However, it was at the 1988 Australian Bi-Centennial Meeting at Oran Park where the s/c 1500cc Wylie Javelin, built in 1950, had its first encounter with a Grand Prix Ferrari with an engine capacity of 4500cc. The latter being the actual car that won the British GP in 1951 when driven by the Argentinian driver Jose Froilan Gonzalez and it was still coloured in French Blue, as it was when raced by Louis Rosier in 1952. It brings to mind the ‘wotif’ or ‘if only’ situation. 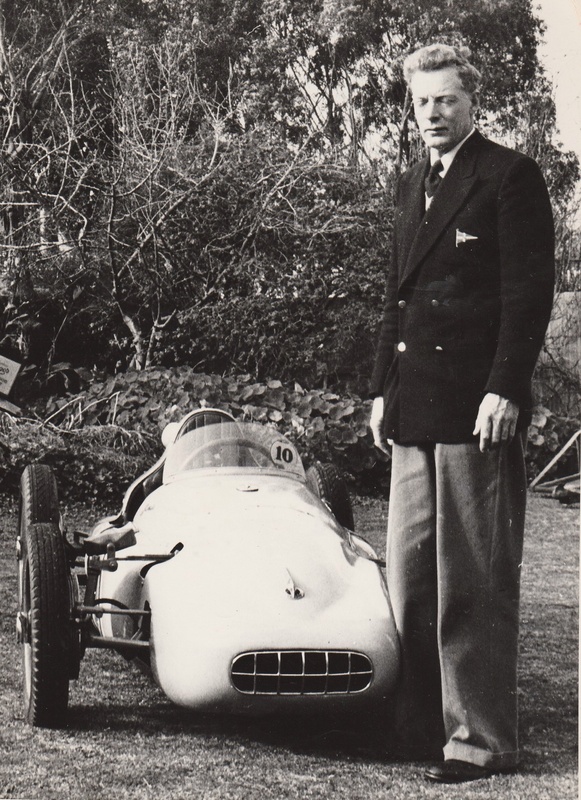 For instance, in Australia, during 1950 we had Wylie, an experienced race driver/engineer building a most innovative rear engined car that would likely fit the specifications for the Grand Prix Cars of the period but the car did not leave Australia as neither the thought nor the finance was considered. 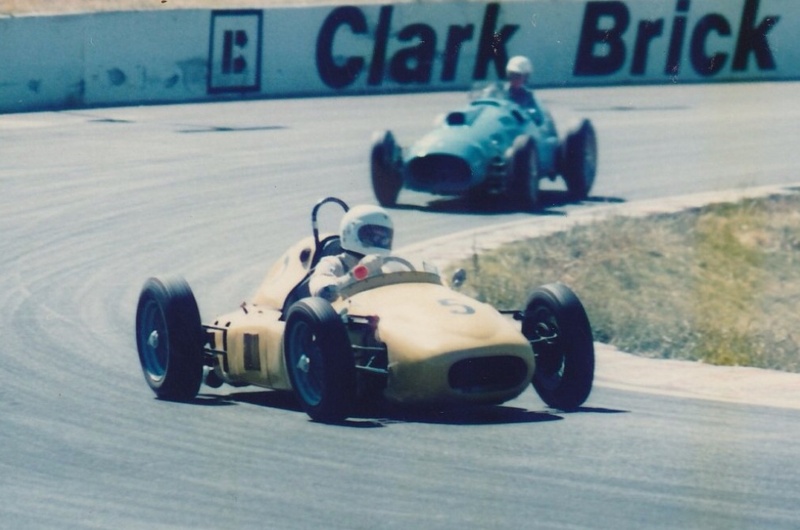 Therefore, while the ‘if only’ situation of an Aussie Special contesting the 1951 British GP was never an issue, the possibility of such a contest could now be staged at Oran Park some 37 years later as both the subject cars were entered. On one hand we had the GP winning Ferrari in the capable hands of its current owner, Gavin Bain of N.Z. who expended huge effort creating a beautiful restoration which included repurchasing back from Australia the original V12 engine where it served time in Ernie Nunn’s record breaking speedboat – after Frank Wallbank of Auburn had remanufactured a new crankshaft and 12 con-rods. On the other hand the Wylie Javelin had also been well prepared for this event. What an opportunity to revisit the past? On the day, and in in a series of races for quite a number of historic cars, there was also ‘a race within the race’ – that of the Ferrari and the Wylie Javelin. 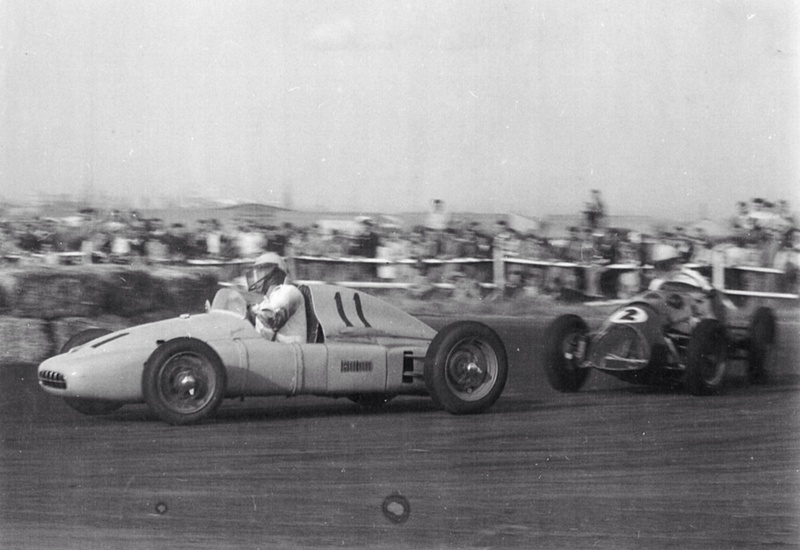 In short, a re-run of the ‘wotif’ British GP of 1951. The day was incredibly hot – so I drained the radiator water and replaced it with 100% coolant. Plus, each time we returned to our pit, my sons-in-law crew (Mark Woolven and Craig Middleton) had buckets of water to pour over the radiator to obviate after boiling – and it worked. Despite the conditions the WJ ran like a clock. The two cars met on four occasions and in the first instance the Ferrari was in the lead – however then the Wylie Javelin increased its pace and for all starts the W.J finished narrowly ahead of the Ferrari. 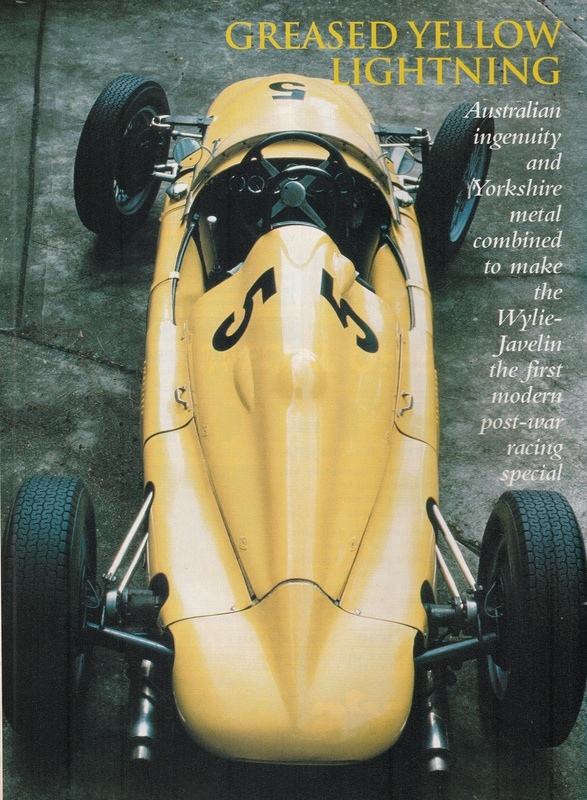 Such a result begs conjecture as to what would have been the case if, in 1951, Arthur and the Wylie Javelin had somehow made it to the British GP – would the rear engined revolution have started earlier? Actually, because of limited funds the Javelin was not raced in the early years, but was hill-climbed successfully. 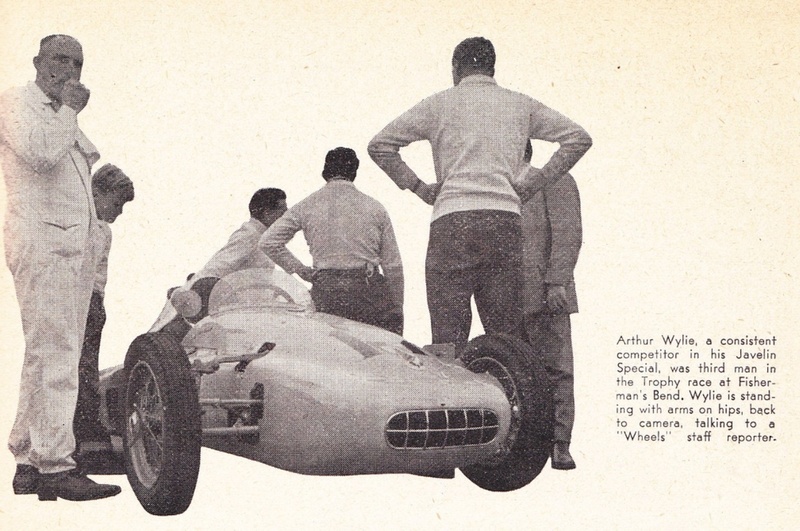 However, it did appear in the 1953 AGP at Albert Park and ran in sixth position until a spin resulted in the loss of three places, which position it held to the end. 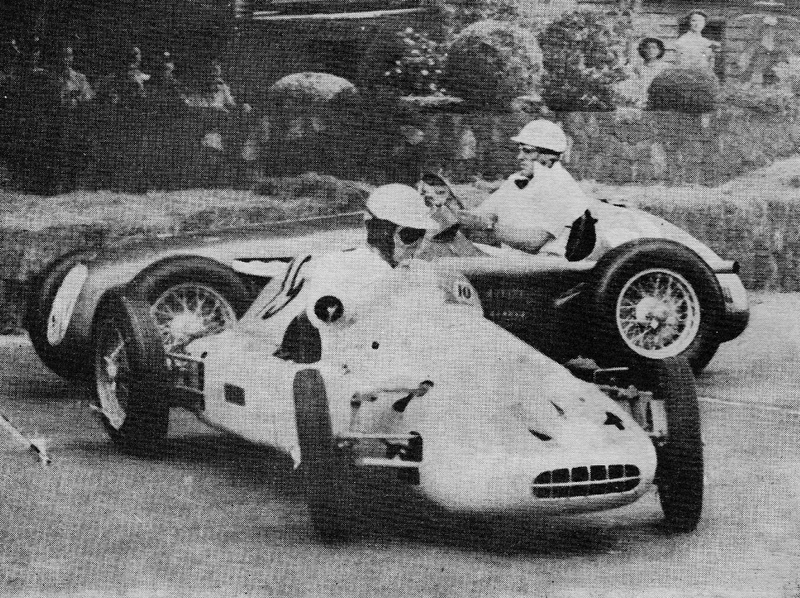 We know that years later, Jack Brabham driving a rear engine Cooper finished sixth in the 1957 Monaco which signified a change, later confirmed by Stirling Moss in a similar car winning the 1958 Grand Prix in Argentina. Clearly, Arthur Wylie was well ahead of his time. Sadly, neither the Wylie nor the Ferrari are likely to meet again as both cars have been sold – The Ferrari to England and the Wylie to South Australia where it sees little active use – its current role is as a display feature at a winery. Bruce Polain was a month old when his father carried him across the Sydney Harbour Bridge on opening day. 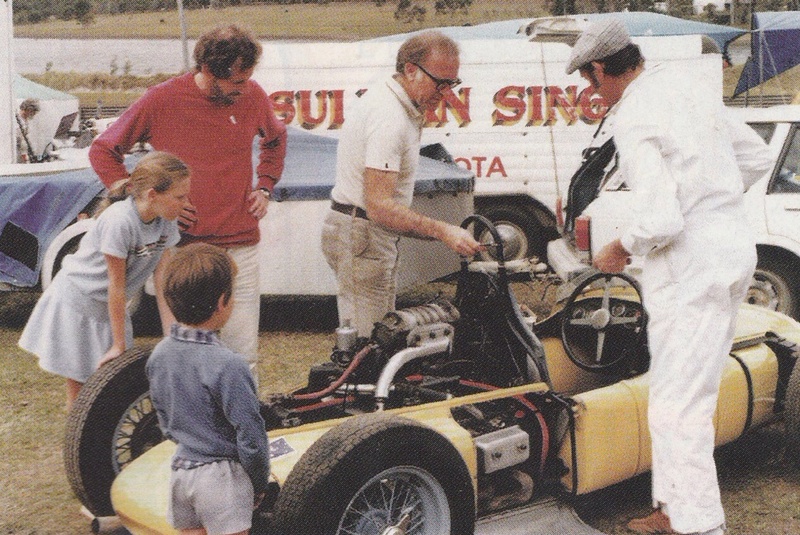 His first involvement with motor sport was visiting Foleys Hill aged 16years 10months while on his ‘L’s, he first raced at Mount Druitt in his MGTC – when racing was only up and down the strip. 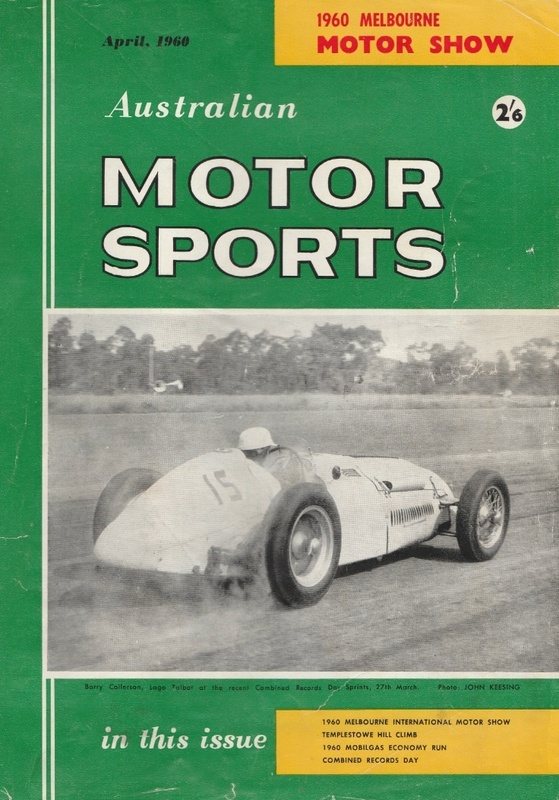 After Mount Druitt was extended, he was part of the Daniel/Spring/Polain entry in the 1954 24 hour race where they won the open (sports) category. Immediately thereafter he left for the UK season as spanner for Mike Anthony in Mk6 Lotus – Mike was number three and Colin Chapman drove the leading team car. This was in the days when Chapman had a day job and Lotus was operating out of a single car garage at the back of his father’s pub. He attended the UK meetings with the Lotus and all the F1 meetings, plus the Le Mans 24 hour and Rheims 12 hour on a Harley Davidson. 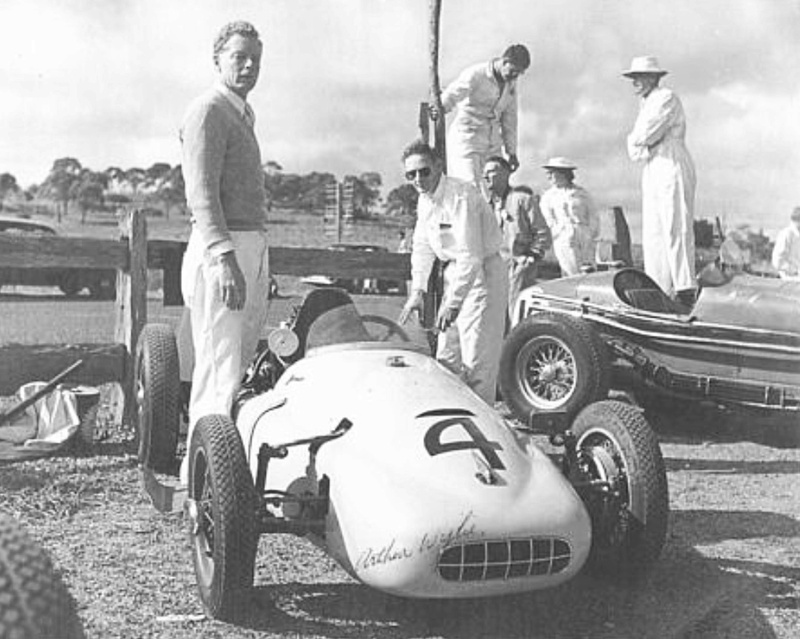 After arrival back in Australia in 1955 he joined Manly Warringah Sports Car Club holding numerous committee positions and promoted regular Foley’s Hill events, 24 hour trials plus probably the most successful Schofields Race Meeting. He inaugurated the Mona Vale Sprint and represented the club at CAMS State Council. He was appointed CAMS Noise Panel Chairman and awarded life membership by MWSCC. He raced a Jowett Javelin at Bathurst 1957 plus innumerable club events which generated his interest in the Jowett based Wylie Javelin, which he purchased in 1963 in very sad condition. After being rebuilt over the years much work resulted in many successes- example Geelong 13.2 Silverdale 39.16. He eventually sold the unique car in 1997. Into the eighties Bruce created and then ran on multiple occasions the ‘Seaforth GP’ which took racing cars to the streets of Seaforth (on Sydney’s North Shore) for three 2.35 km laps. It was an amazing promotion with free entry for driver’s and spectators and always plenty of media coverage on all four local TV networks. 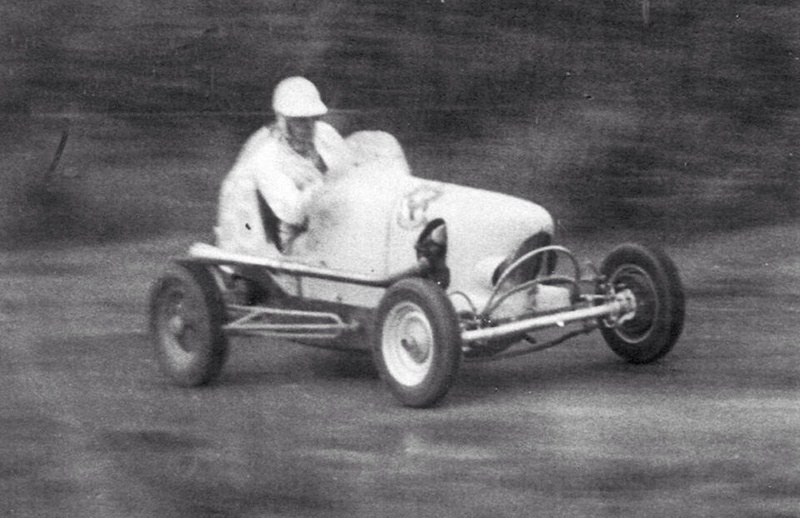 Apart from salvaging the Wylie Javelin from destruction Bruce purchased the ex-Paul England Ausca chassis/body then sourced wheels, Repco Grey engine/gearbox and diff to bring the car back to life, winning at Amaroo in its first appearance. He purchased the ex-Barry Garner Rennmax in bits and again rebuilt it, as well as a Ginetta GT4, began the process for the Thompson Ford and also campaigned a very early Mallock U2. In 1983 he purchased one of Australia’s great racing cars, the Repco Research built Maybach 3 from Lance Dixon. 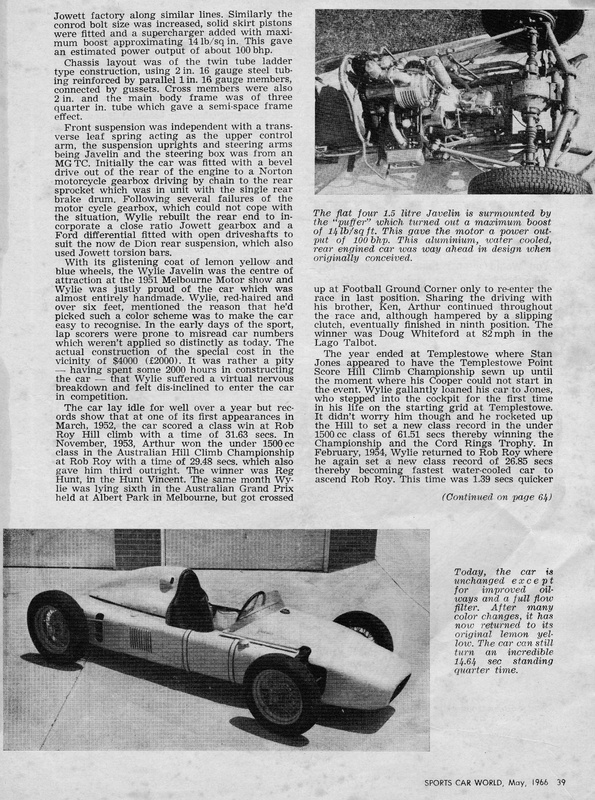 The car was substantially reconfigured by Ern Seeliger after Stan Jones and Repco put it to one side with Stan’s purchase of a Maserati 250F- Ern replaced the Maybach six with a Chevrolet small-block V8, De Dion rear suspension and other changes. In Bruce’s ownership its handling problems were solved with the intention of racing it in the UK in partnership with Arnold Glass where Arnold then living – however the Poms would not accept Maybach’s heritage so the car was sold. In addition to the ‘Spotlight’ snippets in Australian Motor Sport he has contributed race and vehicle reports to Sports Car World, Racing Car News and other magazines – and with the knowledge gained from this pursuit plus the time spent on CAMS State Council has expended much effort on bringing to to CAMS attention many of its deficiencies. In the interim he was the major contributor to the concept of (non-CAMS) ‘GEAR’ and awarded a life membership. GEAR has now been successfully extended to Queensland. When CAMS closed Catalina Park, Bruce was somewhat disenchanted so formed ‘Friends of Historic Catalina’ $40 entry. John Large, then President of CAMS was one of the early members) and spent funds on fence repairs, trimming undergrowth and patching tar- then (courtesy of the Navy, another story) painted the Armco battleship grey, the DSR were so impressed they renewed the licence without consulting CAMS (another story). The circuit was then used for lap dashes for another ten years. When the period for review came, CAMS (although invited, another story) did not officially turn up and that is why the circuit was closed. These days the circuit’s closure is said to be due to indigenous or noise reasons but Bruce claims that is incorrect, as at the time it was just the normal 10-year reassessment, as required under the Local Government Act, that applies to many council operations. That years later, council assigned the area to an Aboriginal Group was not the issue at the time- that latter decision was merely to devolve themselves of the responsibility of maintenance which automatically occurred whilst there was income from motorsport. Professionally he has served decades as a shipping traffic manager, property developer, grazier and executive accommodation operator. Married since 1960 to Tilli – one son and three daughters – Currently writing his memoirs which may put a new slant on CAMS History given that the current CEO rejects consultation. Changes to the cars specifications from the above include a Marshall M200 supercharger, replacement of the Norton gearbox with a close ratio Jowett box which drove through a Ford differential with open driveshafts,. Early in the cars life the swing axles were replaced by a De Dion rear end and torsion bars donated by a Javelin. 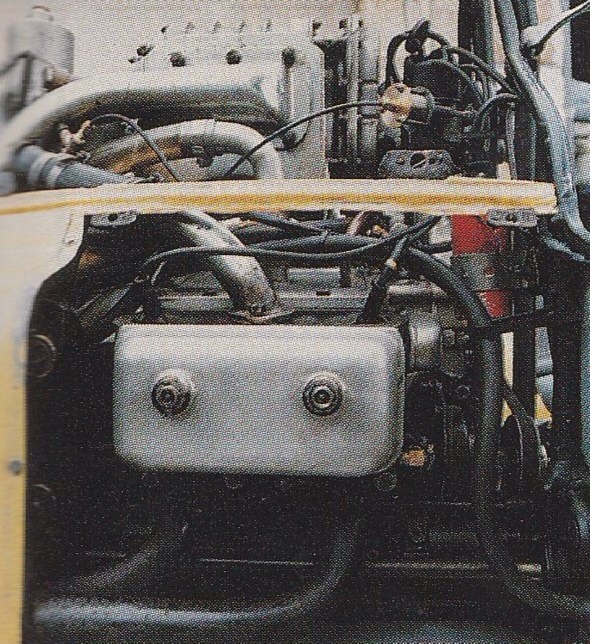 Grainy photograph above shows SU carb at top-left, supercharger and inlet manifold. Standard Javelin heads were modified to allow the exhausts to exit to the rear. Photo above included to show the cars wonderful lines- and a great overhead shot of the suspension. 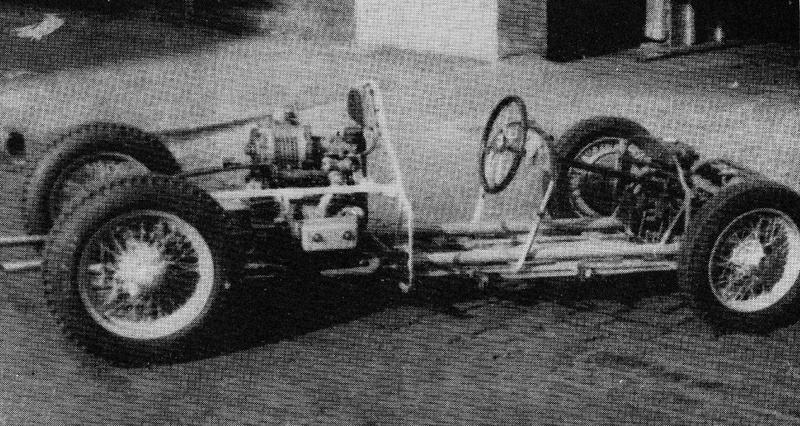 You can see the De Dion tube, exposed axles and twin radius rods. At the front you can see the transverse leaf spring. Twin-fuel tanks, one each side of the driver, whopping big steering wheel and left hand change for the four speed Javelin close-ratio gearbox. To the left shows the chain drive from the crank to blower. In the middle a clearer one of the front suspension which comprises top transverse leaf spring, lower wishbones and co-axial shocks. Front radiator is clear as is the ‘semi’-spaceframe chassis. 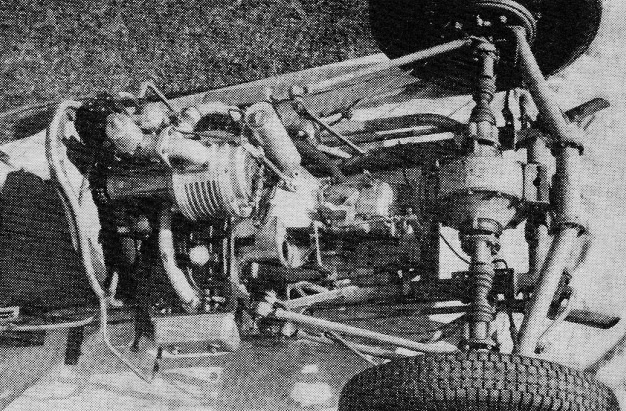 The far right shot is rear suspension detail- to the right the De Dion tube and to the left the open driveshafts/axles from the Ford differential. 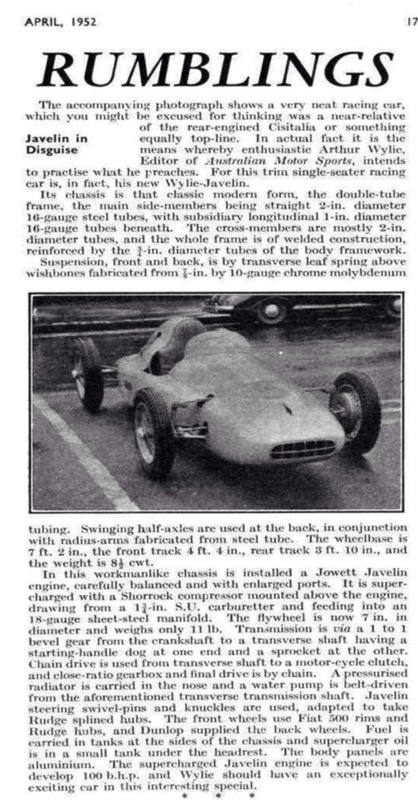 In terms of the rear suspension, Bruce comments; ‘The torsion bar rear end was very clever- the two torsion bars (one either side) run alongside the chassis tubes with the ride height adjustment at the end- all of it was ex-Javelin and standard. As built it would have been fine on those rough circuits but for the later hot-mix variety I softened the suspension with positive results. I took a couple of leaves out of the front transverse spring and ground about thirty thou off the two rear torsion bars- it worked fine’. The two two photos below ‘bring it all together’. The first shows the chassis devoid of bodywork and the two side fuel tanks. It shows the two main chassis tubes and additional structural elements, can we call it a ‘semi-spaceframe’? The other shot above reveals the key mechanical components and their justaposition- Jowett engine and four speed gearbox with the shortest of prop-shafts joining a Ford differential. Open axles and De Dion tube with two forward radius rods each side. Neat, clever, simple. 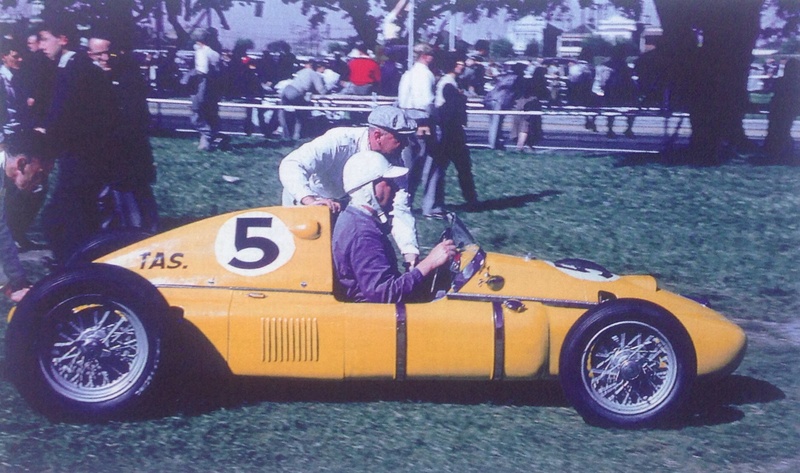 Arthur Wylie and his (and brother Ken’s) Javelin Special, with Wylie looking suitably nautical- I wonder what yacht club it is, in the 1953 AGP Albert Park paddock. Note attention to detail of the new car with its neat little grille and bonnet badge. 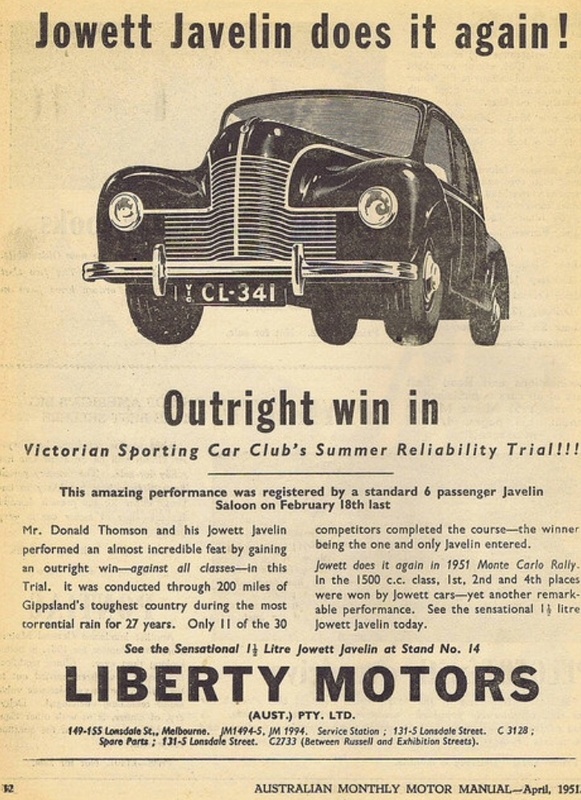 The ‘Javelin Special’ appeared on Jowett agent ‘Liberty Motors’ stand at the 1951 Melbourne Motor Show. Motor Manual reported that ‘One of the most interesting exhibits at the show…was the first pubic appearance of the Javelin racing car designed by leading driver Arthur Wylie. The little rear-engine car took pride of place on the stand and was painted vivid yellow’. 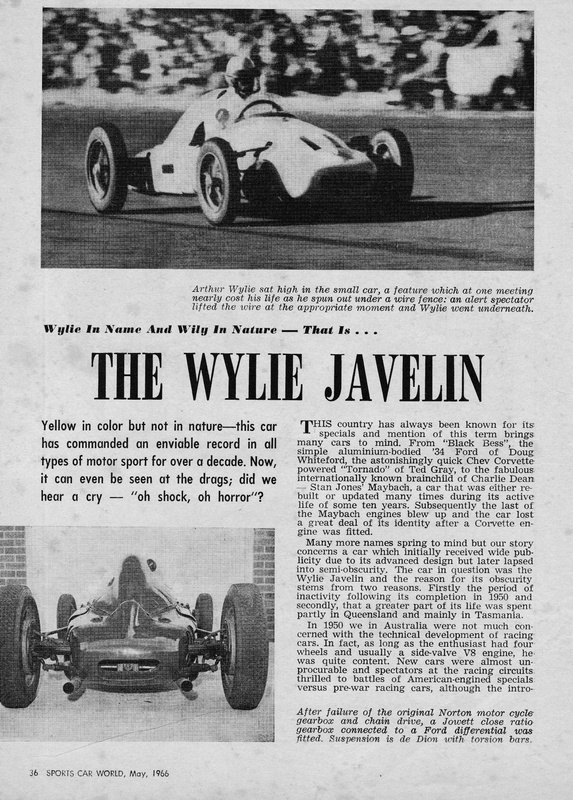 Wylie was dealing with a few health issues as the car was completed, as a consequence the Javelin’s competition debut was delayed- Stephen Dalton’s research shows he entered three races at the October ’51 Bathurst meeting, listing two different engine capacities, 1499cc and 1501cc to get under and over 1500cc, but did not appear, the reason given was ‘driver with a ricked back’. 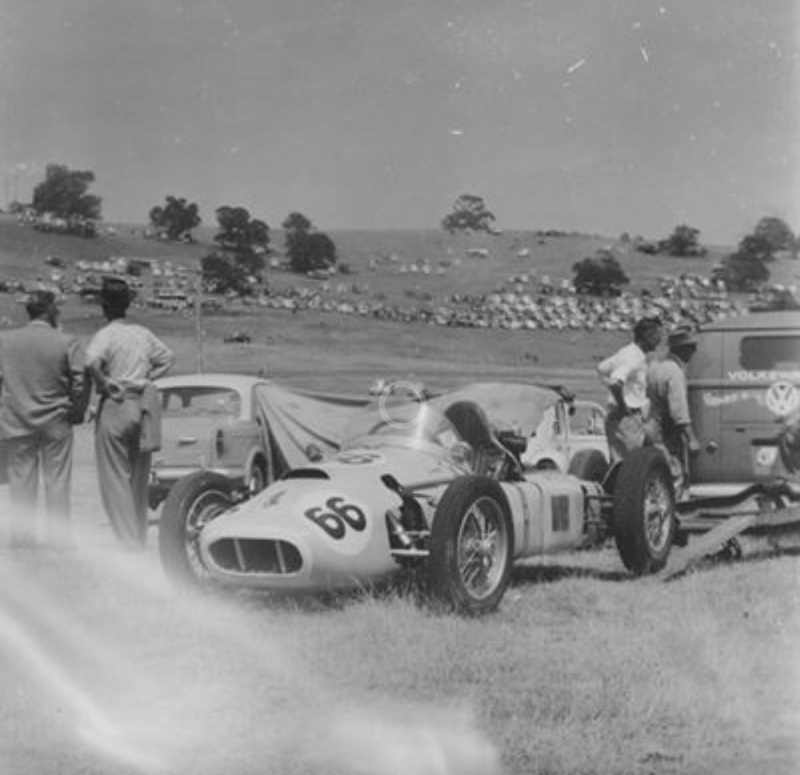 The car finally appeared at the Rob Roy Hillclimb, Melbourne Cup Day meeting on 6 November 1951. He set a time of 27.42 seconds in the first of three runs throughout the day, on one of his runs AMS notes he spun at ‘Tin Shed’ and went across the Spillway backwards whilst feeling the limits of his new car. I wonder if his concerns about the suitability of the swing-axle rear suspension started then?! 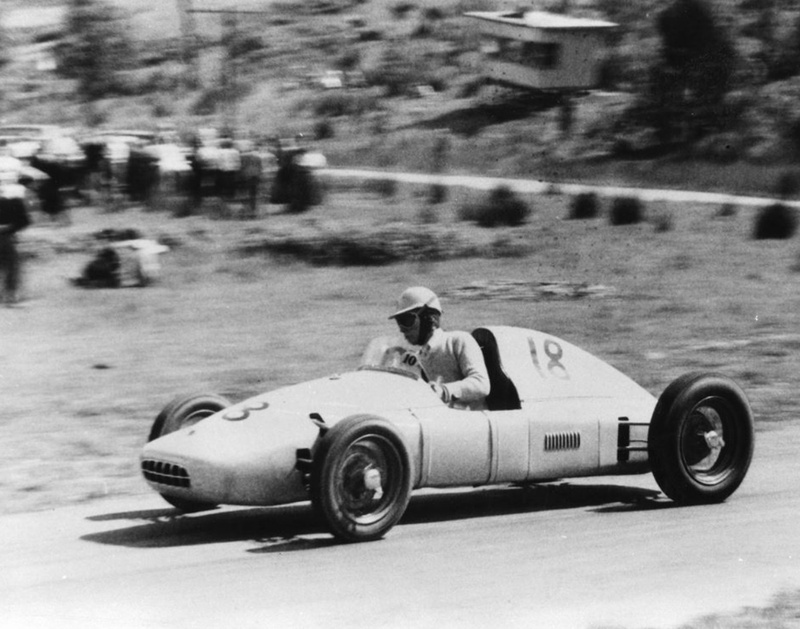 During that notable meeting Jack Brabham won his first road-racing Australian title- the 1951 Australian Hillclimb Championship driving his ‘Twin Special Speedcar’ dirt track midget, which, with the addition of front brakes satisfied the scrutineers of its eligibility. In November 1951 Arthur contested the Victoria Trophy at the LCCA’s Ballarat Airfield meeting, he struggled during the 17 lap handicap race as ‘all his gears had left him except for top’. He took a class win at Rob Roy in March 1952 and on the Templestowe Hill that June. 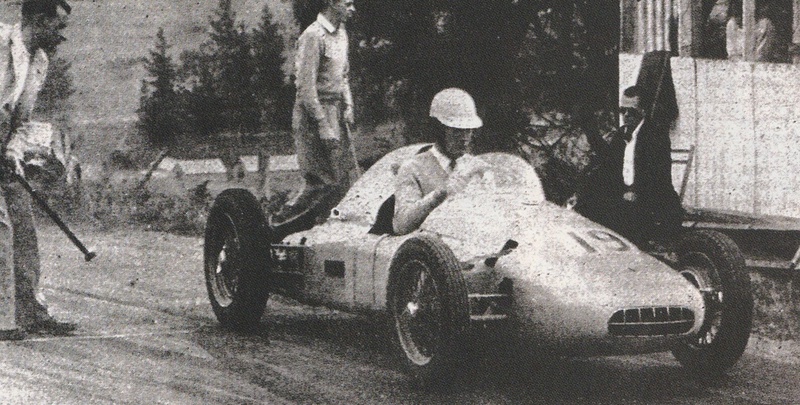 In November 1953, by then with the De Dion tube rear suspension fitted, he took the Under 1500cc record at Rob Roy in the Australian Hillclimb Championship- and was third outright. That same month Arthur and his brother Ken entered the revolutionary little car in the first Australian Grand Prix held at Albert Park on 21 November. It was the circuit’s first meeting, and notable as the first AGP held in a major population centre or city. 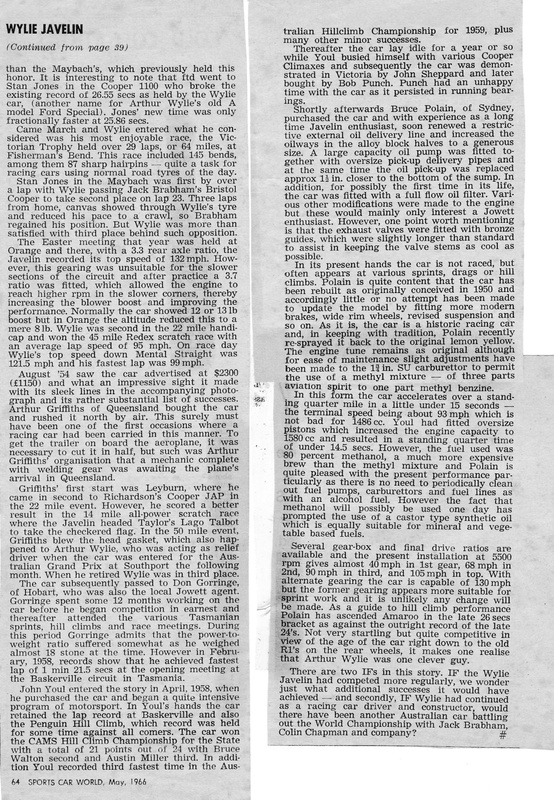 Graham Howard’s ‘History of The Australian Grand Prix’ records that the ‘Most opportunistic start of the field had been made by Wylie’s yellow Javelin, a very accelerative little car, and he strung together a series of openings to be sixth (momentarily fifth) as the field swept through the very fast corners on the opposite side of the lake- and then on the quick left hand kink outside the football ground he lost it and had to wait for most of the field to go past before he could rejoin’. Both Wylies drove the car, they managed to finish ninth overall despite a slipping clutch. Bruce observes that the car then had no baffle behind the radiator and in such a long race both brothers suffered from heat exhaustion as a consequence. The sophisticated nature of the car (below) and it’s unusual appearance drew crowds of people eager to have a look at the Javelin’s secrets, developed as it was by a talented young local. 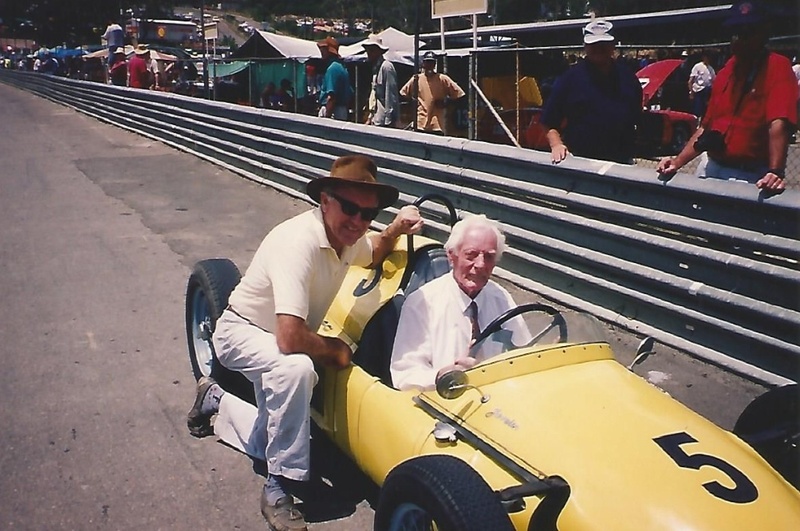 Stan Jones ran the car when offered it by the Wylies when his own Cooper failed at Templestowe, Jones took the car to a class record of 61.51 seconds. At Fishermans Bend in March 1954 (photo above) Ken Wylie contested the Victoria Trophy finishing third behind Stan’s Maybach and Jack Brabham’s Cooper T23 Bristol. In a strong performance Wylie was in second from lap 23 and appeared set to finish in that slot until slowed by tyre wear allowing Jack ahead. The following week Rob Roy succumbed to the little cars speed, Wylie set a class record with a race report recording that ‘this car is a very consistent performer and shows a clean pair of wheels to many of the larger racing machines in the longer road events’. The brothers took the car to Orange at Easter 1954 contesting a series of races at Gnoo Blas- second in a 22 mile handicap and victory in the Redex 45 mile scratch race at an average speed of 95mph a good yield for the weekend. The Javelin was recorded at 132mph using a 3.3:1 rear axle. 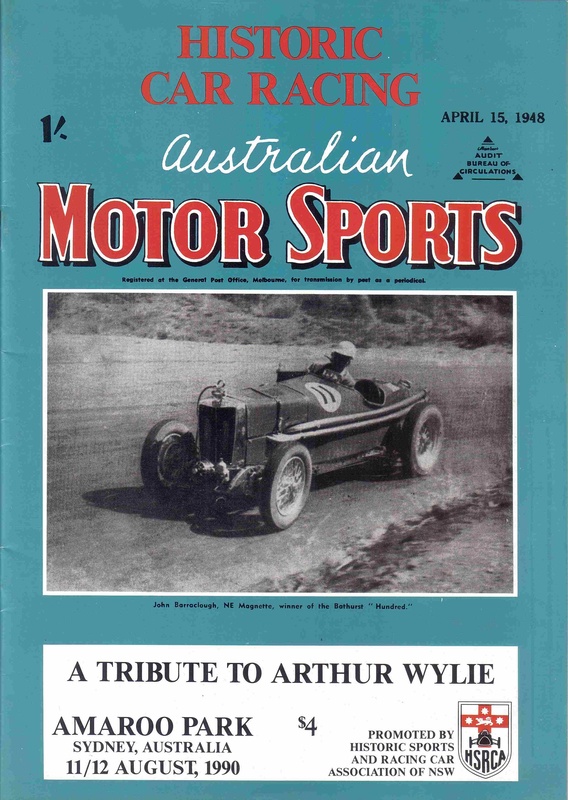 Wylie advertised the car in his Australian Motor Sports magazine in August 1954 and after listing its successes his ad said ‘contrary to what the armchair experts may say, the car has never blown a head-gasket, run bearings or broken piston rings etc. The car has the original motor’. The little racer was bought by Arthur Griffiths of Toowoomba who air-freighted the car and trailer from Essendon Airport in outer Melbourne to Brisbane- the trailer was cut in half to fit into the aircraft and then welded back together again upon arrival in Queensland! 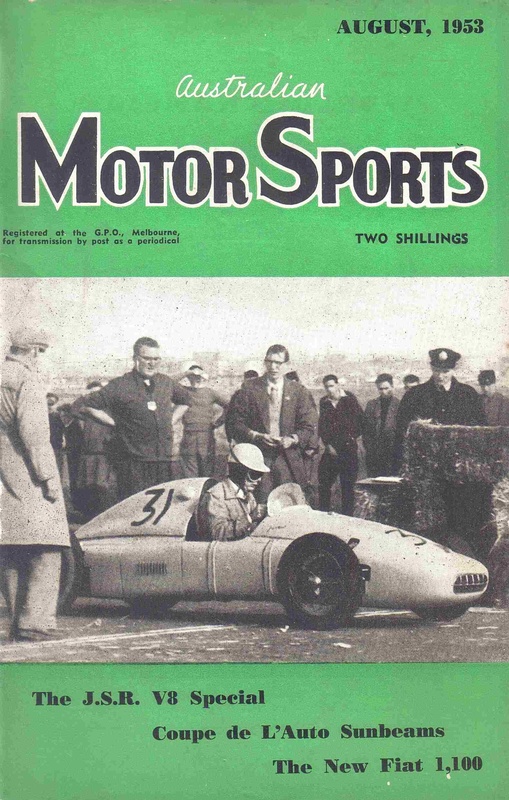 Leyburn was close by to Griffiths, success in September 1954 was achieved with a scratch race victory ahead of Rex Taylor’s ex-Whiteford Talbot-Lago T26C. Later in the day Griffiths won in front of Ken Richardson’s Cooper JAP. 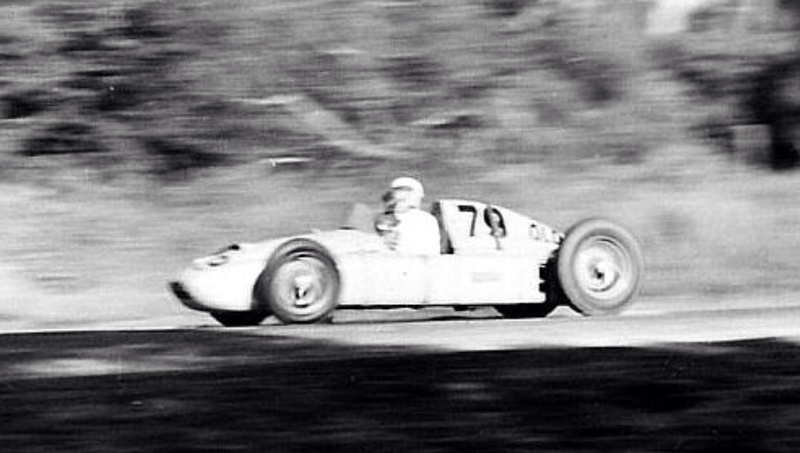 Like practically every other racing car in Queensland, Griffiths entered the Javelin in the 1954 Australian Grand Prix held at Southport on the Gold Coast. Motor Manual reported that ‘Arthur Griffiths…was one of Queensland’s main hopes in the race. For the first two thirds of the race he fought a continuous duel with Doug Whiteford (Black Bess Ford V8 Spl) but within a lap of Whiteford’s withdrawal the Javelin blew a cylinder head gasket forcing him out of the race’, he was in third place at the time. Lex Davison won this dramatic race in an HWM Jaguar. 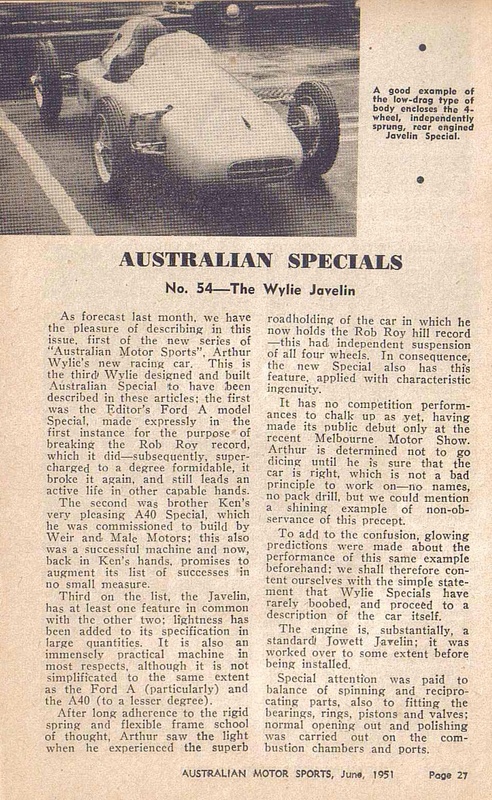 It was about this time the car obtained the name ‘Wylie Javelin’, which was thought to more appropriate after the car moved from Wylie ownership although its nickname amongst the racing fraternity was ‘The Goanna’ given the similarities in physical appearance of the reptile and car! In March Griffiths raised the flying quarter class record at Leyburn from 112.7mph to 117mph but during the June meeting a rear axle failure caused a considerable rebuild- he was leading Geordie Anderson’s Jag XK120 at the time. The car then passed back to Arthur Wylie in Melbourne before he sold it to Don Gorringe who was the Jowett agent in The Apple Isle, Tasmania. 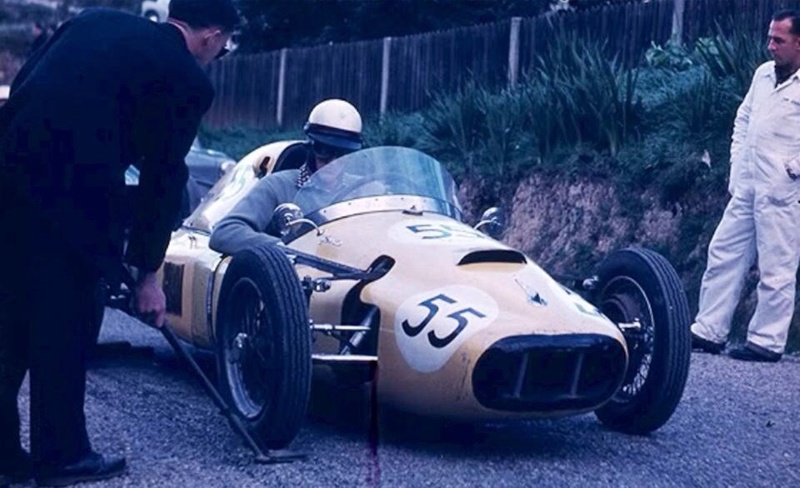 Gorringe’s first meeting in the little machine was under the Wylie’s supervision- he contested the support events at the 25 November 1956 Tourist Trophy meeting at Albert Park, the wonderful photo below shows the car in the capacious park’s paddock. Gorringe had much success with the car and as a notable businessman about Hobart it was not uncommon for Don to drive the racer on the road, it was a quiet place after all! I have written about the Tasmanian Youl brothers previously. 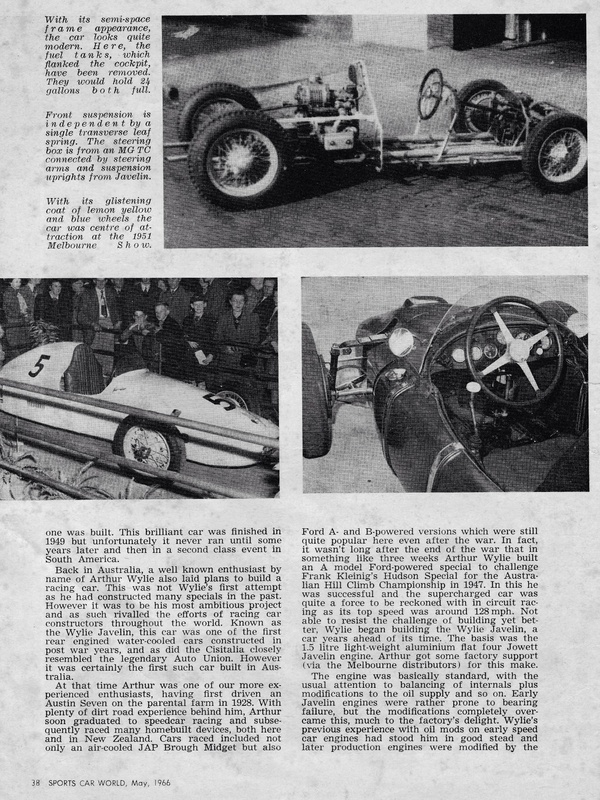 The young graziers were making their way in motor racing, John was looking for the next step up from his Porsche 356 and in April 1958 acquired the Wylie Javelin racing it at all of the local venues. He won races inclusive of setting a lap record at Baskerville, won a state hillclimb championship, took the Penguin Hill record- perhaps during the March 1959 meeting which he won, and finished third in the Australian Hillclimb Championship held at the Queens Domain, Hobart in November 1959- Bruce Walton in the Walton Cooper took the win that day, the second of six ‘on the trot’ championships Bruce won. 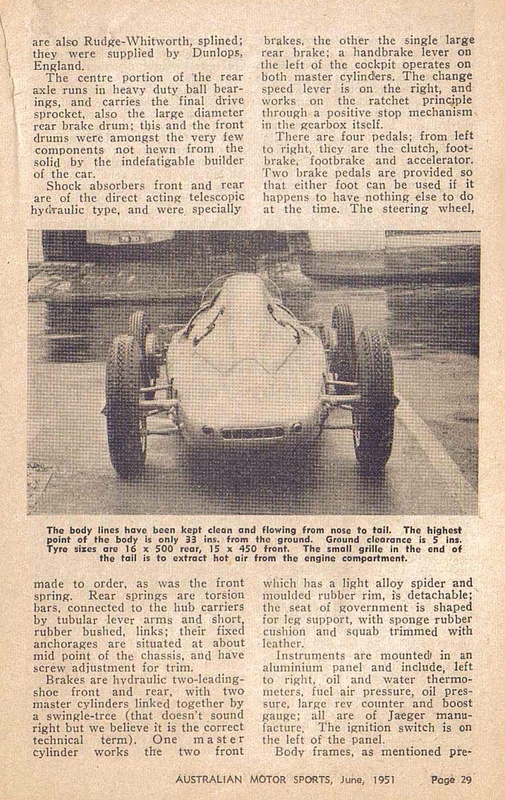 Youl completely rebuilt the car and commented at the time that it was the best handling machine he had ever driven. 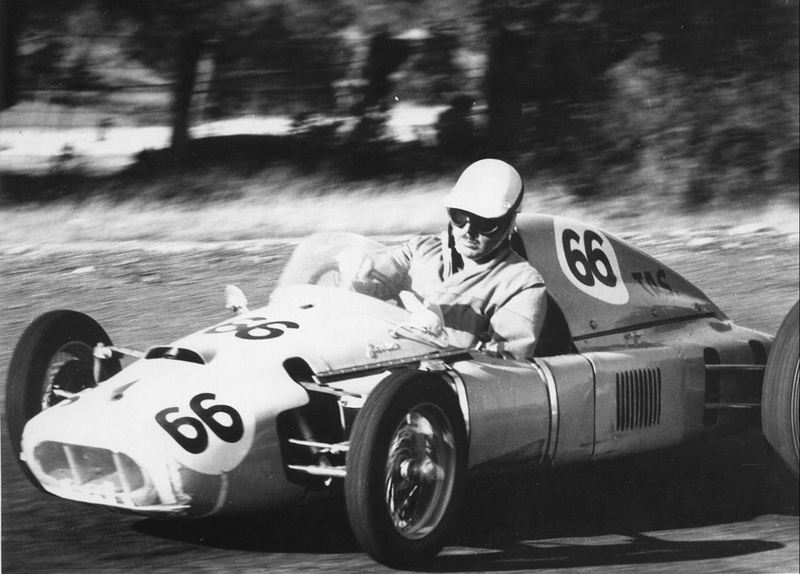 After he bought a Cooper T51 Climax to step into national competition the car lay idle for a while but was eventually taken to Victoria by John Sheppard on John Youl’s behalf- and was then sold to Victorian, Bob Punch. When Punch offered it for sale, frustrated with its reliability, he was considering fitment of a Peugeot engine, it was at this point Bruce Polain came in- the little car was lucky Jowett enthusiast Polain came onto the scene then. The car was never cut and shut or butchered with other mechanicals in an effort to keep it competitive with more modern machines. The racer continued to live an active life with Bruce a much loved member of the historic scene. It appeared at the first ‘All-Historic’ meeting at Amaroo Park in 1976 with John Youl as guest-driver in the Grand Parade. 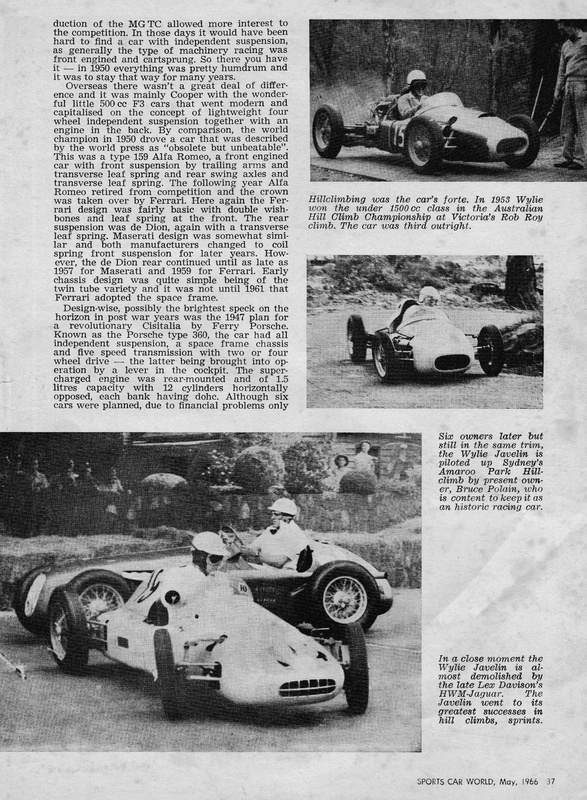 Stephen Dalton very kindly sent through this article on the new car from the June 1951 issue of Australian Motor Sports- before the car had first raced. 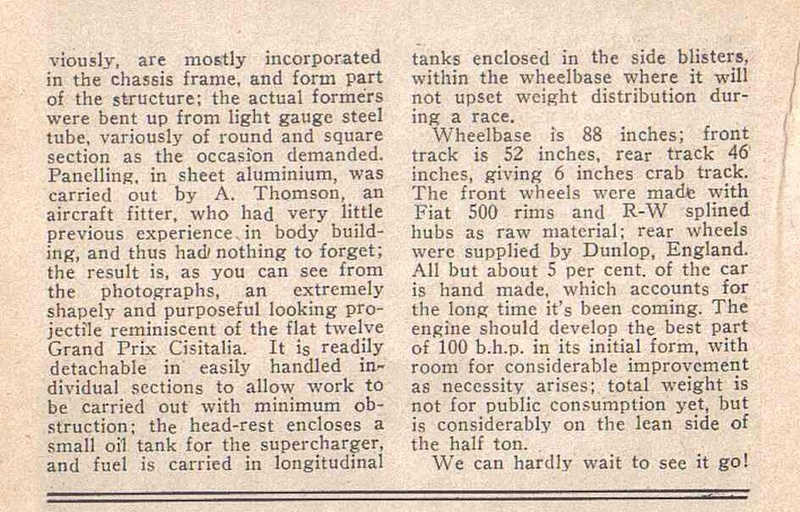 Bruce has found an article about his car way back in 1966, it may be a bit challenging in parts to read but is included for completeness. 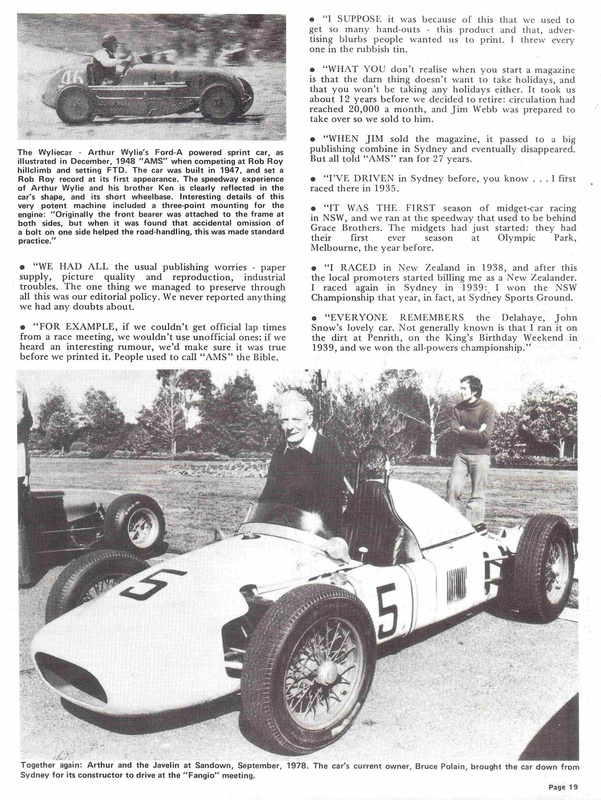 ‘The pages relate to the 27-28 January 1979 Amaroo Historics meeting, with the Wylies guests for the meeting. A nice insight into Arthur and AMS’ wrote Stephen Dalton.